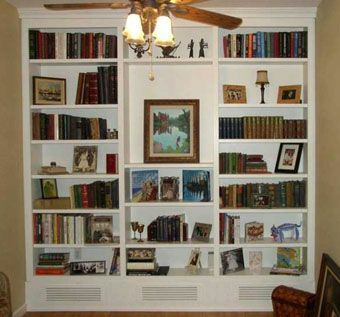 This bookshelf was designed in collaboration with the homeowner. Part of the design consideration was to have this piece look like it was original to the room and not that it was a second thought. We custom made the vents and designed the unit to sit above the heating vents in the floor. We provided detailed drawings and sample paint colors to the client. At first, the client had a difficult time visualizing what the unit would look like once it was completed. As the design process continued, they were able to visualize and became very excited about having their unit built. Upon completion they stated, "This is exactly what we wanted."